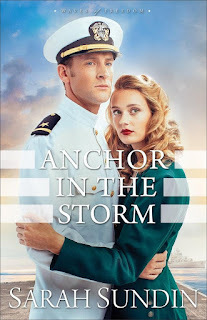 When I had the chance to read Anchor in the Storm, the second book in the Waves of Freedom series, I didn't have to think about it at all. I reviewed Through Waters Deep, the first book in the series, which I loved. And I have loved every book by Sarah Sundin. I knew I'd love this one too. One of the things I enjoy about Sundin's work is how well-researched everything is. Related to that, there always seems to be some little thing that isn't widely known, such as the deep divide in the United States about joining in World War II prior to Pearl Harbour, that she highlights in her books. In Anchor in the Storm, that issue is battle fatigue. Today, we know it at PTSD, or post-traumatic stress disorder. We've been studying WWII in school here lately, and just today watched a re-enactment of Patton chewing out a soldier for being a coward. That was the usual diagnosis at the time. Buck up, do your job, are you a man or aren't you? The Patton incident isn't addressed in this book, but the attitude is certainly present. Sundin does such a terrific job of making these men who are suffering "with their nerves" into real people you care about. Well, some of them anyway. Some of the men dealing with PTSD are not very sympathetic characters. Probably a lot like real life. Book #3 is not due out until Spring, 2017. I will be waiting. You can see what others had to say about the book at the Litfuse Blog Tour page! Thank you for the lovely review! I'm so glad you enjoyed Arch & Lillian's story. And I'm super-glad you're studying WWII! The Patton incidents were particularly stunning. I actually included one of the slapping incidents (there were two) in my novel On Distant Shores.